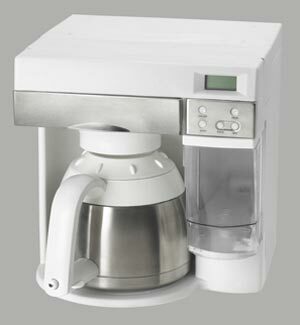 Which under cabinet coffee maker should you choose? Under cabinet coffee maker's greatest value is to save space. In fact, one of the more popular range by Black and Decker is called exactly that, Space Maker. This machine allows you to make coffee like any drip coffee maker, without taking any space on your kitchen top, great for small household. I covered in best coffee makers' article,choosing the best mean getting the one that is right for you. And out of the 4 factors, under cabinet coffee maker fulfill the 'plot' factor best. To say that these coffee maker save space, is an understatement. The fact is, being under cabinet, they simply do not occupy any space at all! 'Plot' factor wise, they would score a 100%! With regards to the other factors, price wise they are pretty economical, with most models hovering around the USD$ 50 range. 'Phew' factor is average as they come packed with more bells and whistle than your average drip coffee maker, so they would tend to be slightly more complicated. But, nothing out of the ordinary that a layman cannot handle. In the 'popularity' factor, if we compared it with Bunn, under cabinet coffee maker is nowhere near. However, one should note that we do not buy coffee makers based on how popular they are, but how well they suit our needs. And these under cabinet coffee maker was engineered to meet one need -space constraint. If one is living in the suburbs, where houses can be ten over thousands square feet, who need a space saver? But, in major city where housing does not exceed a thousand square feet, dedicating a space for a coffee machine ie really a luxury. Okay, you get the point that under cabinet coffee maker is good for city dwellers that need everything to be compact. The next question, is which brand would be good for this task? There are a couple of players which one can choose from, ranging from the Contour (anyone heard of it?) to the famous 'space maker' from Black and decker. Call me a snob or biased, but if I want to get a piece of technology for great cuppa -I go to the big boys. In this case, it would be Black and Decker. Let's put it in perspective, would you get your under cabinet coffee maker from anybody or from somebody that actually developed equipment for space exploration and can boast of equipment doing work on the moon? ** The year was 1971, and Black and Decker drill head done work on the moon and removed core samples. That kind of resume, I believe not many company can boast about! And if I would to go for a Black and Decker, I would forgo simplicity and go for technology that can make my coffee experience much more exciting. It would be the 'spacemaker, Model ODC425'. This under cabinet coffee maker pack the usual features of coffee machines, the major difference is the option to mount it under your counter top. Two other interesting feature which is rewarding to coffee drinkers are the 'Tap-A-Cup' and the 'Sneak-a-cup'. 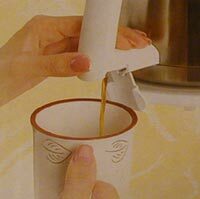 The 'Tap-A-cup' is a feature that allows one to tap into brewed coffee supply without removing the carafe. And if you are talking about under the counter, it is as simple as pressing a button for hot coffee. The 'Sneak-A-Cup' is definitely designed for impatient folks. It allows one to get a cuppa even while the coffee is brewing! Other than these technology, the Black and Decker ODC 425 invest quite abit of technology into the materials. Imagine a stainless steel carafe that keep coffee hot for hours. And remember the coaster that you got to have in order to prevent the carafe from scratching or marring the surface. With ODC 425, this situation is non existent. Reading until this portion, do you have the inclination that this ODC 425 under cabinet coffee maker is more like a toy than a machine, and I must say that it does indeed some fun element into the brewing coffee experience. Is Under counter coffee maker for you?